After a brutal snowstorm in the Cascade Mountains, Chris Jacobs discovers two things he never expected to see: the charred shell of a cabin, and Gianna Trask and her sixteen-year-old daughter huddled in an SUV, having barely escaped from their burning vacation rental. Still scarred from a childhood ordeal, Chris knows there’s something sinister about the scene—it’s the stench of burned flesh. Forced to wait out the blizzard in their rescuer’s retreat, medical examiner Gianna Trask wonders if her hidden past has finally caught up with her. When a body is found in the destroyed cabin’s ashes and a forest ranger is brutally murdered, both Gianna and Chris must confront their secrets if they want to escape the violent threat lurking outside. In the fifth book in the Bone Secrets series, Kendra Elliot leads readers on a dangerous, twisting journey of two lives forever changed by a fiery snowstorm in the mountains. Known by Kendra Elliot is a 2016 Montlake publication. This fifth installment in the 'Bone Secrets' series gives Chris Jacobs top billing, when he meets Gianna Trask and her teenage daughter, Violet, under extreme circumstances. When Gianna’s cabin retreat catches fire, she and her daughter barely make it out alive. Chris also happens to be at his cabin at that time and brings the ladies to safety. But, he knows right away the burned-out shell of the cabin will reveal a very serious crime and that Gianna and Violet could be in danger. Sure enough, it quickly becomes crystal clear that Gianna is a target…. But why? 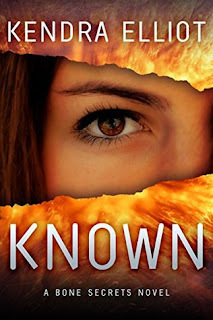 I always enjoy Kendra Elliot’s romantic suspense novels, and this one is no exception. I love Chris Jacobs and was pleased to see him meet a kindred spirit in Gianna. The story is fast paced, intense, suspenseful and emotional. The plotting is tight and unfortunately it captures the underbelly and greed of human nature all too well. It’s also a poignant family drama, with a bittersweet tone to it. The action grabbed my attention right away and kept me riveted by building the suspense with perfect pacing, until it reaches a race against time drama that kept me glued to the pages. The author did a terrific job of creating characters I could care about, and balanced the romance with the suspense exactly the way I like it. Overall, I really enjoyed this book and will keep my eyes peeled for the next installment in this series!! ALSO AVAILABLE WITH KINDLE UNLIMITED! 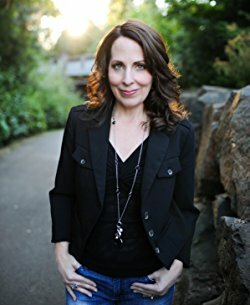 Kendra Elliot has sold over 4 million books, hit the Wall Street Journal top ten bestseller list five times, and is a three time winner of the Daphne du Maurier award. Her 2017 release, A MERCIFUL DEATH, was a #1 Amazon overall bestseller. She is also an International Thriller Writers' finalist and a Romantic Times finalist. She grew up in the lush Pacific Northwest and still lives there with her husband, three daughters, two cats, and two Pomeranians. She's always been fascinated with forensics, refuses to eat anything green, and can't wait to wear flip flops every day.